So, if you want to add something unexpected to a holiday feast, try this gluten- and dairy-free dessert that is sure to please, alongside the traditional pies. We enjoy it plain, but you can dress it up with a sweet glaze or sprinkle some maple sugar crystals on top once it has cooled. I typically sweeten the batter with coconut sugar, because it has a much lower glycemic index and calorie count than either white sugar or maple sugar. 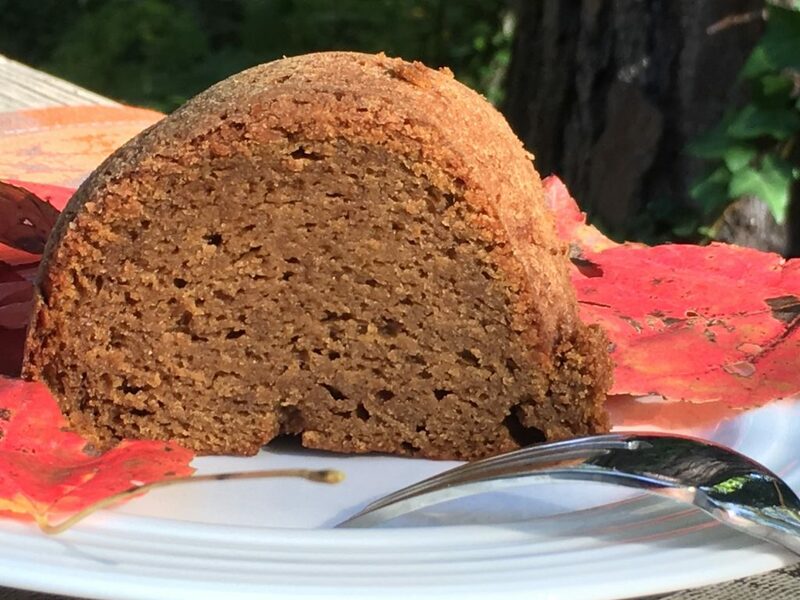 Of course, maple sugar is lighter in color, and for that reason I wish I had baked this cake with the maple for a photo as it would likely be more aesthetically appealing to the American consumer’s eye! Maple sugar has some additional nutrients, compared to coconut sugar, and Ayurvedic expert Dr. Vasant Lad says that maple products (syrup or sugar) are “strengthening.” Here’s more on maple vs. coconut sugar. Either way, you’ll have a delicious cake that won’t last long at your holiday buffet! If you’re new to the Sacred & Delicious Blog, you can also find some recipes for wonderfully delicious, traditional, healthy Thanksgiving side dishes right here. Finally, I’d like to acknowledge the trauma and deeply troubling problems that millions of Americans face going into this holiday. First, I offer my condolences and join in grief with thousands across California who are suffering from the destruction wrought by the horrifying fires and their aftermath. Thousands more are still recovering from the loss of homes during the devastating hurricane season. For many, such events may preclude the niceties of baking cakes and pies and the joyful cooking of a traditional Thanksgiving meal. Still, millions more across our country suffer from chronic unemployment, underemployment, and poverty, finding such festivities impossible unless they are able to get to a soup kitchen. For those of us who are able to revel in the abundance of the holiday season, may we always make space in our hearts and at our tables for those who are less fortunate. Wishing each of you a sweet Thanksgiving filled with all the traditions that bring you joy! 1. Remove eggs from the refrigerator 1 hour or more before assembling the cake so they can warm to room temperature. 2. Prepare the pumpkin: Adjust the oven rack to the lower-middle position, and preheat oven to 425˚F. Cut the pumpkin in half and scoop out the seeds. Cover the bottom of a 9×12 (or larger) baking dish with a piece of parchment paper. Place the pumpkin halves with the flesh down on the paper, and cover with foil. Bake for 1 hour or until the pumpkin flesh is completely tender when you poke it with a fork. Let it cool. Scoop out the flesh and purée all or part of the pumpkin in a food processor. Check to make sure there are no lumps, and if you find any, pulse again until completely smooth. Move purée to a strainer and strain over a mixing bowl while you’re making the cake batter. (Note: if you skip this step, your cake will be delicious but overly moist.) Measure out 2 cups of purée, and set it aside for the cake. 3. Make the batter: Grease a 10-inch (3 quart) nonstick Bundt or tube pan lightly with ghee. Then lightly flour the pan, inverting it to tap out excess flour. Preheat oven to 350˚F. 4. Whisk together flours, xanthan gum, baking powder, baking soda, salt, and spices in a mixing bowl. Set aside. 5. Whip the ghee in a separate large mixing bowl with an electric mixer for about 2 minutes. Add the sugar and beat well. Add the eggs, one by one, beating briefly on a low speed after each addition. Add the vanilla, and mix. 6. Using a spatula, fold the pumpkin purée into the egg mixture and stir until completely mixed. Then, fold in the flour and spice mixture. Mix until the batter is just smooth. Spoon the batter into the pan and smooth the top. 7. Bake 50 to 55 minutes or until a wooden pick or skewer inserted into the center of the cake comes out barely clean. Let cool two hours in the pan; then invert the pan onto a rack and let the cake cool completely before slicing. Cover the cake in a domed container but do not refrigerate. Keeps for three days. 8. Make the maple sugar glaze (optional): Grind maple sugar in Vitamix or professional quality blender to a powdery texture. Combine glaze ingredients in a small mixing bowl, and beat at medium speed with an electric mixer. Drizzle over a cooled cake. Let the glaze set at least 30 minutes before serving. Cook’s Tip: Bake the pumpkin the day before. Ayurvedic Notes: Almond and oat flour have some additional nutritional value (compared to gluten-free mixes) and both are easy to digest. Both do, however, increase kapha somewhat, as will sugar of any kind. As mentioned above, coconut sugar has a lower glycemic index and calorie count than maple sugar, but maple is said by Ayurveda to be strengthening to the body. Pumpkin is fine for all doshas, in moderation, as are the spices, making this a good dessert choice on occasion. This cake is made with almond milk as a dairy substitute, as milk and eggs are considered an unhealthy combination. Without the glaze, this is also a low-sugar recipe, making it a fine dessert when eaten in moderation. Enjoy it with the glaze for a special occasion! Omit the maple glaze. Less sugar is better for Kapha!